Imagine a class that resembles a music design studio or a workshop of design and artistic creation. Imagine this class to be a place of experimentation and discovery and to introduce students to complex mathematical problems and natural phenomena. These images of the future, which present a creative classroom of experimentation - a studio and a place of creation and discovery, have in fact been their roots many years back, at a time when science and art were inextricably linked and charismatic people, such as Leonardo Da Vinci were equally excellent artists but also unique scientists and inventors. As the years passed the world of science was removed from the art of art. In recent years, the interaction of these two worlds seems to become more and more powerful again. On the occasion of the modern educational tendencies that call for the reunion of science and art in order to promote the creativity of small students, Ellinogermaniki Agogi in cooperation with a large number of institutions from Greece and abroad organizes a series of unique activities for teachers on 2 and 3 November at the school's premises in Pallini. There, you will find interactive classes of experimentation and scientific discovery that give us the opportunity to look at tomorrow's classroom where advanced technologies become educational tools that support the optimization of learning outcomes and help achieve deeper learning. * An experimental space is presented by the Laboratory of Physics of Music. In this class, students can, for example, discover how sounds are produced, how they differentiate each other, learn their characteristics, and design the musical instruments that produce them. They can study the characteristics of their musical instruments, test them in a virtual studio, improve and perfect them. And then, when satisfied with the result, they print on three-dimensional printers and have the opportunity to use them as well as to work with their classmates and to prepare a musical event where real, virtual and printed musical instruments blend harmoniously into a unique musical listening. * In another class, researchers from major research infrastructures show that the signals coming from the Universe can be presented to the public through music. Complex phenomena (eg particle collisions) are transformed into musical compositions. * Another site simulates a future colony on Mars inviting visitors to think about the future of exploring space. Advanced, virtual and augmented reality applications perform real-world activities on the surface of the Red Planet based on the real conditions prevailing there. * The class of artists is transformed into a theatrical workshop where teachers will have the opportunity to learn how to guide their students to develop a theatrical performance of thematic sciences. The Leaching Science Through Theater demonstrator will be presented to the visitors and will participate in an interactive fashion where they will be involved in the creation of short performances inspired by mathematics and natural sciences. 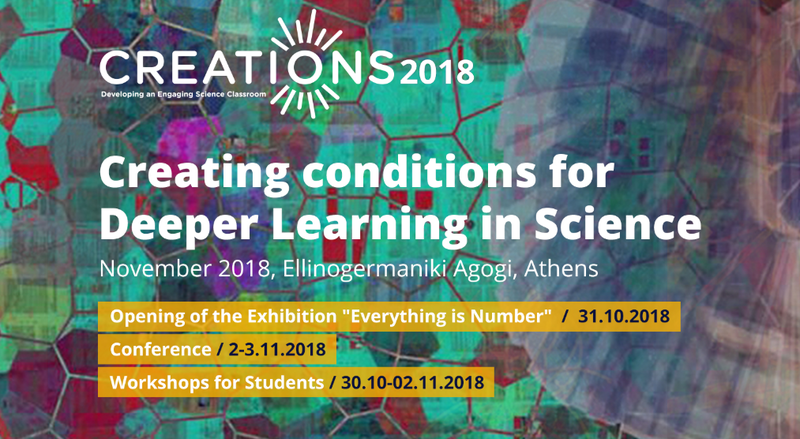 The final conference of the CREATIONS project invites teachers, scientists, artists and stakeholders from all over the world in order to share their views and experience on how to teach advanced scientific concepts in the classroom using Art and Creativity as vehicles. Additionally, on the occasion of your participation in the conference, you can visit the art exhibition of the Swiss artist Eugen Jost, which will be hosted in the premises of Ellinogermaniki Agogi. The Title of the exhibition is "Everything is Number" and uses Mathematics as a source of inspiration.